Sir Isaac Newton. Famed ponderer of imponderable questions. 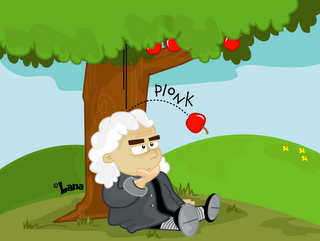 Let's get something straight right off the bat: Newton did not discover gravity. He explained it. There's a difference, you know. I mean, if Newton actually had discovered gravity, what were people doing before hand? Randomly floating about? But let's skip that for now and contemplate an imponderable question of our own. If you will think back into recent history, you will remember that I am on vacation. And as a result, I warned that I may post an oddity, or I may not. Monday and Tuesday saw oddity posts while Wednesday and Thursday did not. But here it is, Friday. And the question is, 'Will otter post an oddity, fulfilling my day with joy, or will he disappoint me yet again, leaving me to suffer through a dreary day?". What would be funny is if I were to just leave you hanging, waiting for an answer. But then, that would be the answer. I also contemplated writing a long, rambling post about nothing, but then realized that would be exactly like a normal oddity. So I decided.......The final boss fight in the Diablo 3 expansion could wait a bit while I write an oddity. We interrupt this post with a public health warning! If you suffer from allergies like otter does, and you take loratadine tablets daily, (generic Claritin), and you discover you ran out, DO NOT WAIT A WEEK BEFORE YOU REPLACE THEM! It seems otter ran out last Tuesday and kept forgetting to replace them. On Sunday, he was laid low by his allergies because the effects of his loratadine had worn off. Monday was spent so hopped up on decongestants that otter spent the day on his couch, sleeping. And Tuesday, he realized exactly what was going on, so he replaced his supply. (some may speculate that otters being knocked out by allergies is the explanation for the lacking oddities posts. They would be right). By Wednesday he felt well enough to lay down his kitchen floor, and Thursday was spent....well, I ate breakfast and lunch...and dinner, I think. Lesson learned: allergies can hamper your enjoyment of a vacation so remember to take your drugs! Anyway, moving on to todays oddity: Gravity. Or grabity, as I have heard it called. Because gravity 'grabs' items and pulls them down. Gravity is a complex thing. And for Newton to explain it was an amazing thing. People could finally understand why something fell down when they dropped it. But what about space? We've all seen footage of astronauts floating around in 'Zero G' up in space. But that's wrong. Zero G is a myth. There is plenty of gravity in space. Gravity is what causes the planets to orbit. Gravity is what causes a perturbation that knocks a long-term comet out of the Oort cloud. Gravity is what broke up the comet Shoemaker Levy 9 and caused it to smash into Jupiter. Gravity is one of the four fundamental forces that make up everything. (the others being electromagnetism and the strong and weak nuclear forces). So the thought that one of the most fundamental forces wouldn't exist in the medium that makes up 99.9999% of the universe is laughable. When you see astronauts floating around the ISS, they are actually experiencing gravity. About 10% less gravity than when on Earth. So why do they float? It's an optical illusion! OK...not really. But it's complicated, so I'll try to simplify it. Every object that has mass has gravity. On Earth, mass and weight can generally be substituted for each other, but they are two different things. Go to the moon and your mass will be the same, but your weight will be about 1/6th of what it is on Earth. This is due to the Moon having less Mass than Earth, creating a weaker gravitational pull. In space, you aren't on anything, so the gravitational effects you feel come from all around you. For example, the ISS get's it's gravitational pulls from the Sun, Earth, the Moon, Mars......everywhere, basically. So, why do astronauts and objects float? The truth of the matter is, they aren't floating. They are falling. (This is the optical illusion I was talking about). Due to it's proximity to Earth, it is Earths gravitational force that is exerting the most force on the ISS. And that force is attempting to pull the ISS down. But, by using their thrusters and momentum, the ISS isn't falling down. It's falling sideways. It's like dropping an item out a moving car window. It will not land at the spot you drop it, but farther down the road, depending on your forward speed. This is the effect of momentum. If the car is moving at 60 MPH, everything in the car, including the object you drop, is also moving at 60 MPH. Therefore, instead of striking the spot underneath it when dropped, it's momentum causes it to hit a few feet down the road. It's the same thing with the ISS. Even though it is not floating in space but falling, because it has momentum, it does not fall down to Earth. Instead it falls sideways, causing it to orbit. The reason everything seems to float is because everything is falling at the same speed. If a giant was to reach out it's hand and grab the ISS and stop it in it's tracks, it would act much like a car smashing into a wall. Only the ISS would stop. Everything inside it would keep moving until something stopped it. We've all seen the effects of impact of a car moving at 60 MPS. Now imagine the ISS. It's moving at 17,000 MPH. So, gravity exists in space. Zero G is a myth. Hey....I said it was complicated.....I did try to simplify it. Whatever. Happy Friday. At least you got an oddity. As for me, I'm going to Menards to buy stuff.